EverGreen Agriculture is an innovation adaptable to a wide range of agricultural systems across the dry lands, lake-basins, coastal regions, semi-arid and arid areas, and sub humid to humid zones. 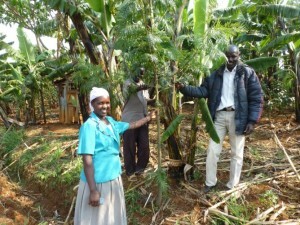 As such, its potential can be enormous with millions of farmers being able to benefit from it. Its practices cater for livestock (both in lowland and highlands), cereal agriculture, and cash crop farming systems, providing an opportunity to smallholder farms with limited resource base, experience in declining soil fertility, food and income security and are severely exposed to effects of climate change and variability. The system is therefore suitable to all farming needs, be it timber, poles, energy, livestock feeds, food and nutritional security, income generation, soil fertility and improved yields, climate change adaptation and mitigation, among many other benefits. For instance species such as Grevilea robusta, Senna spectabilis and Melia volenski are popular for the timber and fuelwood they provide. Alleviating poverty and hunger among poor rural households and realizing sustainable development goals are thus achievable with adoption of EVA systems.